In 604, a cathedral dedicated to St. Paul was built on Ludgate Hill, the highest point in London. That cathedral burned, its replacement was burned by the Vikings in 962 and its replacement was also destroyed by fire in 1087. The Normans soon began building a replacement, but its construction was interrupted by fire. In 1240, what became known as “Old St. Paul’s” was finally completed and was destroyed in the Great Fire of London in 1666. Today’s St. Paul’s, completed in 1710, was designed by Sir Christopher Wren, who is buried in the crypt below. During World War II, a German bomb that would have destroyed St. Paul’s was defused. Until 1956, a law precluded London buildings higher than St. Paul’s and its famous dome could be seen from throughout the city. That law was repealed in 1956 and St. Paul’s lost its claim as London’s tallest building to the BT Tower in 1962. 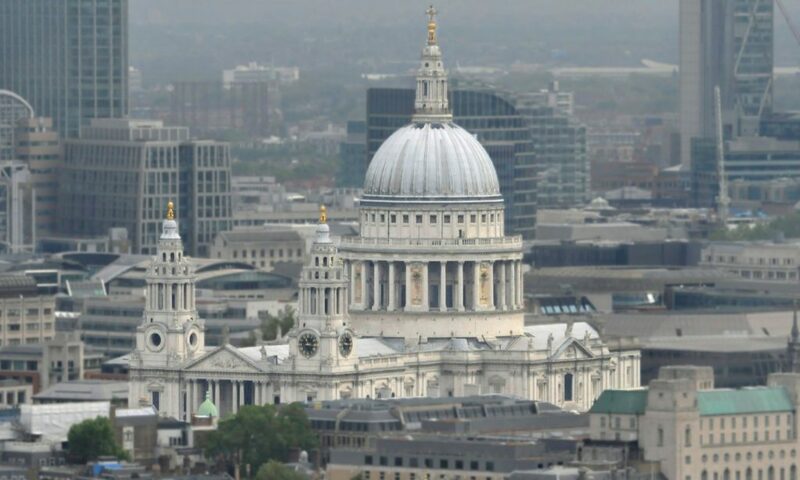 Today, more than 60 London buildings are taller than St. Paul’s. Eight visual corridors leading to unobstructed views of St. Paul’s dome are legally protected, but there is pressure to eliminate them in the name of architectural progress. The time may well come when the best view of St. Paul’s dome is from atop the London eye.